Today is the final day of the National Young Audiences Week (YA Week) and we are happy to announce a free closing extravaganza for New Brunswick area families. 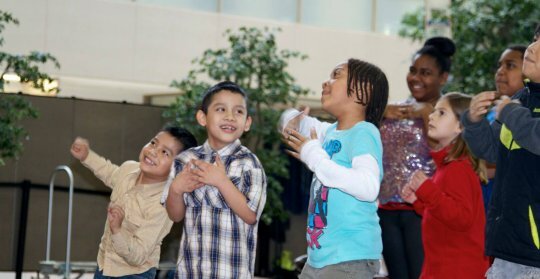 Organized by Young Audiences of New Jersey & Eastern Pennsylvania, this annual family arts festival will include performances from multicultural dance troupes, hands-on dance workshops, and even an on-site health fair focused on childhood health and wellness issues. Children of all ages are welcome, accompanied by a parent/guardian or their favorite adult. The festival, Dance for Life, takes place, Saturday (today! ), March 21st, from 1:00-4:00 pm and will be held at the Arline and Henry Schwartzman Courtyard at Robert Wood Johnson University Hospital. This popular family event is presented annually by Young Audiences New Jersey & Eastern Pennsylvania, in collaboration with the Community Health Promotion Program of RWJUH, with generous support from Johnson & Johnson. Learn more about this event. Last year alone, YANJ/EP provided programming to 711 schools serving 406,000 students. Their Sandy Hurricane Relief Initiative brought 12 affected schools year-long arts residencies that focused on healing and visioning a bright future. After two successful years of NRG Creatively Green Family Arts Festivals, funder NRG Energy, agreed to expand the program nationally. Now this year, six YA affiliates will join YANJ/EP in producing events that explore the intersection of art, sustainability and science. In 2014, YANJ/EP celebrated New Jersey’s 350th anniversary by creating YA Arts EdVenture, an outdoor festival featuring performing artists, historical interpreters and a cultural village. Attended by 1,700 students and 312 teachers, the event honored New Jersey’s rich history of diversity, innovation and liberty. This year’s Arts EdVenture field trip will take place at The New Jersey State Museum in Trenton on June 3rd & 4th. 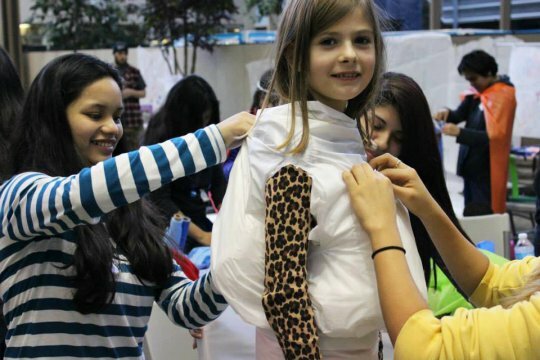 A family festival wouldn't be complete without costume making!